The Fenouillèdes is a wild region of the Roussillon, its name deriving from the fenouille – or fennel – that covers its hillsides. 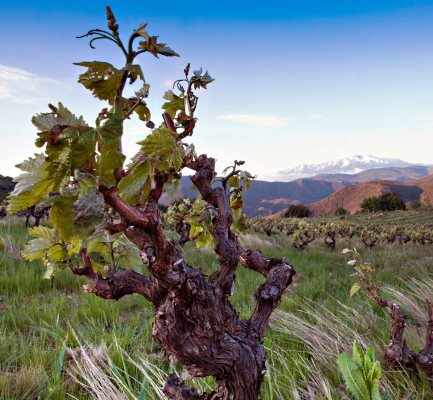 In 2001, local winemaker Gérard Gauby discovered a specific terroir, high in the foothills of the Pyrénées, with some more or less abandoned vineyards. Believing the area could produce something special, Gauby joined forces with local vigneron Éric Laguerre and Gauby’s UK importer, Roy Richards and Mark Walford, and Le Soula was born. Le Soula’s 22 hectares of vineyards are spread across the hillsides, at between 350 and 600 metres in altitude. There are some very old pre-existing vines, some dating from 1919, and though supplemented by more recent plantings, the average age of the vineyards is still around 30- to 50-years-old. Red grape varieties are Carignan, Syrah and Grenache, while white wines are painted from a much broader palette consisting of Macabeu, Sauvignon Blanc, Grenache Blanc and Grenache Gris, Vermentino, Marsanne, Roussanne, Malvoisie and Chardonnay. Soils are largely granite, with a smaller area of slate and limestone. From the birth of Le Soula the vineyards were managed organically, and are now worked biodynamically. Oak barrels are important in making Le Soula’s wines, but the smallest used today are 600-litre barrels, up to huge, old foudres. Fermentation is with wild yeasts. The recipe will be so familar to advocates of ‘natural’ wines, and indeed Le Soula have introduced their own ‘orange wine’, La Macération du Soula, a white wine made with skin contact, to join the white and red wines in their small range. The focus of Le Soula on expressing its specific terroir, along with excellent first releases in 2003 (of the 2001 vintage), soon gained Le Soula something of a cult following, including that first Le Soula Blanc 2001 being awarded 93/100 by me in 2004. Further excellent scores from me followed in 2010, and a tasting feature in 2011. Since that article, the vineyards were certified organic in 2012, the same year that Roy Richard’s business partner Mark Walford took over running the estate. A new vigneronne, Wendy Paillé, joined in 2016 to replace Gérald Standley, who had been with Le Soula since 2008. The range has expanded too, with second wine ‘Trigone‘, and a special cuvée called ‘Le Mordoré‘, as well as the aforementioned orange wine. This tasting was something of a revisit, with the 2008 Blanc and Rouge in the line-up, last tasted by me seven years ago and, according to wine-searcher.com all of the vintages tasted below are still available for sale in limited outlets. (2018) It's a full seven years since I last tasted this wine, when it was a relatively youthful three-year-old and scored 91/100. Now, with a decade under its belt, the blend of 38% Sauvignon Blanc, 35% Macabeu, 19% Vermentino and a handful of other varieties shows a slightly deeper colour and has a lightly sherried aspect on the nose, but still intense apricot and creamy, oatmeally character, the large, old oak barrels used for fermentation and ageing just adding to that. In the mouth a touch of bruised apple, but there is still real fruit sweetness there, allied to a citrus peel acidity and touch of phenolic grippiness, that gives structure and length. Drinking well, it is showing a little age, but hard to say where it will go from here. (2018) Pouring much the same colour as the 2008, and with the same touch of age showing aromatically, this is a blend of 59% old-vine Macabeu and 18% Sauvignon Blanc, along with Grenache blanc, Chardonnay, Malvoisie and a touch of Vermentino. Mostly made in stainless steel, 28% saw time in new and old 500-litre barrels. Rich, golden in colour and aroma, leesy cream and baked apple, but a brightness to the fruit beneath a touch of oxidation, quite ethereal floral nuances flit in and out. Nice palate, again similar to the 2008, medium- to full-bodied, generous, but still with a core of excellent cirtus peel, fatter acidity. (2018) The blend for this 10-year-old wine 55% Carignan, 35% Syrah and 10% Grenache Noir, with a minuscule yield of 14 hl/ha, two thirds spending 21 months in 500-litre barrels, old and new. Similar colour to the 2010, maybe slightly more dense though with a little more ochre apparent on the rim. Obviously more ripe, more dark berry fruit-driven than the 2010 with a plushness that the 2010 is missing. The palate shows a good tangy orange and cherry acidity, riper and smoother tannins and that density if fruit. It's a really close call, but if pushed I'd marginally prefer the slightly more weighty yeet balanced style of this vintage, though going back to the 2010, the leaner, more mineral style also has great appeal. Again drinking well now and I would not cellar for much longer. (2018) Substantially more Carignan in this 2010 (71%), again from 65-year-old vines, along with 25% Syrah and 4% Grenache Noir. Yields of 13 hl/la and 71% of the blend spending 20 months in 500-litre barrels, old and new. It's a full percentage point lower in alcohol, and pours a medium plum colour, woth a broad, light rim. Fine graphite and dried blood character to red fruits on the nose, becoming very nicely sweet-fruited on the palate, ripe summer berries and a firm tannic underpinning. There's a dry, liquoricy touch of extract, but then freshness too with elegant acidity. Long and enjoyable now, but I probably would not cellar too much longer. Tanners has the wine as an 'oddment' at time of writing but there are other by the case stockists.